It didn’t take long for the Browns to give up the pretence that they’d improved over the summer, it only took them two quarters of moderately good play before they began playing like the Browns again. The Browns got off to a pretty good start, working the ball methodically down the field and spread out the targets. The Tight Ends in particular were very involved. The Browns controlled the ball and worked it down to the Red Zone but after a false start and two incomplete pass the Browns were left with 3rd & Goal from the 14. Then disaster struck. As Josh McCown, who was scrambling for the third time on the same drive, dived for the end zone he was hit by two Jets Linebackers, fumbled and got concussed. Who was to fill the void? Johnny F****** Football. 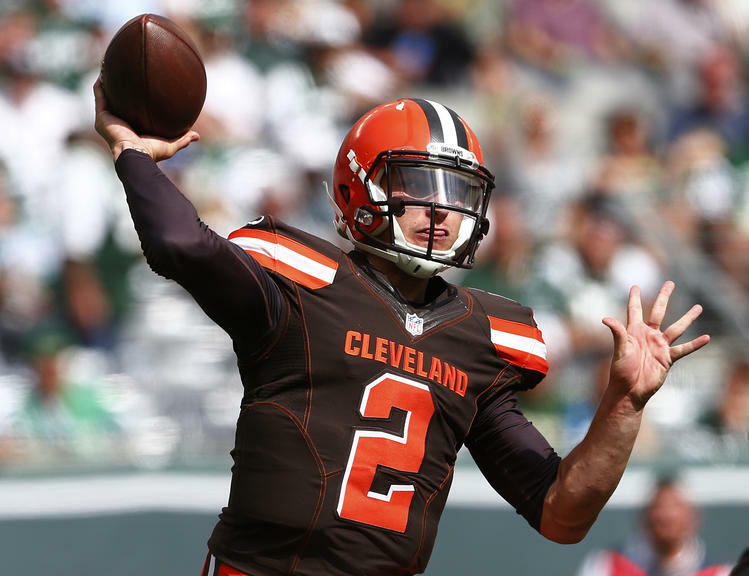 After not having practiced with the first team since the third preseason game due to a sore elbow, Manziel was called upon to come in and lead the Browns. Things got off to a good start as Manziel connected with Travis Benjamin, who was streaking down the sideline after Antonio Cromartie bit on a hesitation move. The 54 yard pass was only Manziel’s second of the game. The Browns then proceeded to break the record for the longest PAT in NFL history after having two penalties called. The Jets scored on their next drive despite a Tashaun Gipson interception. Gipson managed to pick off Ryan Fitzpatrick but in the ensuing return lost the ball after Brandon Marshall ripped the ball off him. The Browns scored a field goal and conceded a touchdown to leave the score at 14-10 entering halftime. The Browns offense slowed down a lot in the second half as Manziel showed that he was only making his third ever start. The Browns first drive ended with a poor throw and interception before a couple of successive punts. On both sides of the ball, the Browns struggled with the run. Manziel began to get sloppy in the fourth quarter, fumbling on successive drives. The Jets started to run up the score a bit after benefiting from numerous short drives from turnovers. 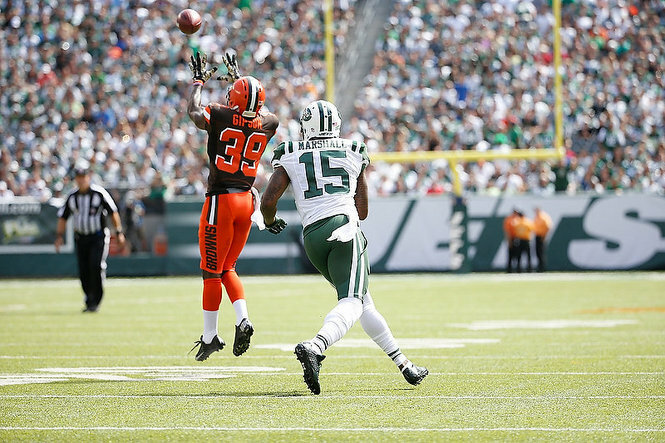 Overall it was a disappointing loss for the Browns with plenty to take forward to Tennessee. There are some concerns though. One of the main concerns I have is the offensive line which seemed to constantly be in trouble, whether it was with penalties or with not creating any lanes in the running game. This is supposed to be one of the best in the NFL and I expect them to improve but they won’t be happy with the way they played. The secondary had issues too with Joe Haden not living up to his high standards. He seemed to be constantly over matched by Brandon Marshall who used his size and physicality to his advantage. Tashaun Gipson will also be disappointed to have dropped that interception. I know some people were critical but I thought that Johnny Manziel and Jon De Filippo both had good games. Manziel hadn’t taken a snap in two weeks and was better than expected. He made a poor throw on the INT but I wouldn’t be too worried about the fumbles as he still won’t be fully at NFL speed after 3 games. We also saw signs of his new found attitude to preparation with him going through his reads rather than scrambling. De Filippo called a nice game with plenty of quick passes which helped Johnny avoid holding onto the ball for too long. The Browns return to Cleveland next week to host Marcus Mariota and the Titans.